It's all change in the mobile phone world. Three years ago Nokia headed Motorola and Sony Ericsson. Suddenly, Apple, LG and Samsung have crashed the party and made the normal leaders look like geeks sitting in the corner. Well, except Nokia, but unless the Finns get their first touchscreen device right, the advantage could start eroding. And the Koreans, LG and Samsung, haven't been sitting back either, which is demonstrated by the recent deal by LG to be the first to include Dolby Mobile on its…well…mobiles. Dolby Mobile uses some complex algorithms to boost the performance of sound on handsets, and the results have been very impressive, and will help mobiles move from a tinny sound to full-on decent audio. This includes Mobile Surround, creating a virtual surround sound effect, Sound Level Control for monitoring volume and Sound Space Expander (you can guess what that does). 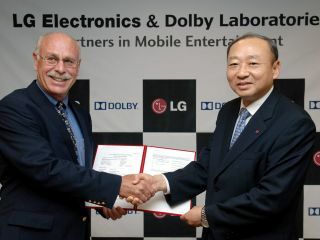 "Being the first company to incorporate Dolby Mobile technology into handsets for the global market reinforces LG's role as a leader in the mobile industry and in multimedia phones," said Dr. Skott Ahn, President and CEO of LG Electronics Mobile Communications Company. "We believe this technology will raise the bar for audio quality on multimedia phones and expect Dolby Mobile to help us create a new trend in the mobile phone industry. "LG is committed to providing our customers with the best features available and our new collaboration with Dolby helps us deliver on this pledge."